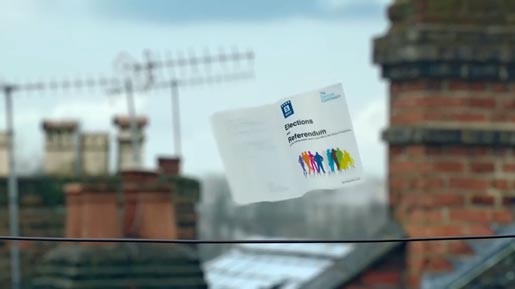 The Electoral Commission and COI (Central Office of Information) in the UK have launched an advertising campaign introducing the booklet with all the information people need for the referendum on voting systems (First Past The Post or Alternate) to be held on May 5, 2011. “Birds”, a television commercial in 30 second and 20 second versions, follows the booklets flying through town and country until they reveal their final destinations: every letter box in the UK. 76 Ltd director Yann Secouet worked closely with a team of puppeteers to bring the flying booklets to life. The campaign includes print and online material and directs people to the Electoral Commission’s website aboutmyvote.co.uk. The Birds campaign was developed at Farm, London, by creative director Gary Robinson, copywriter Edward Copland, art director Lee Williams and agency producer Nicole Sloane. Filming was shot by director Yann Secouet via 76 Ltd with producer Dominic Wilcox, executive producer Mark Murrell, directors of photography Tony Brown and Jeremy Braben, colourist Matt Turner at Rushes, production designer Ged Clarke, 1st art director Jez Oakley, editor Luke Deverill at Content Post. Post Production was done at Absolute Post, London, by VFX producer Dan Bennett, Flame artist Simon Holden, 3D artist Richard Nelson. In-camera Puppeteering and VFX were produced at Asylum. Music was produced at Finger Music.